You'll find no shortage of posts at the PPC featuring the Avengers' devoted butler, Jarvis, yet no profile of this gentleman's gentleman* would be complete without a look at the story that follows up on the injuries inflicted on him during the seizing of Avengers Mansion by the Masters of Evil--specifically, the brutal treatment he received at the hands of the sadistic and merciless Mr. Hyde. Held hostage inside the mansion along with Captain America and the Black Knight, Jarvis was beaten nearly to death by Hyde, who was acting under the orders of Baron Zemo in order to break Cap's spirit--though Hyde, having had his own operations foiled by Cap in the past, needed no urging to take out his anger on someone that Cap highly regarded. The Avengers eventually turned the tables on Zemo and his cohorts, fortunately in time to save Jarvis's life and rush him to medical care. And now, receiving the grim prognosis of his recovery from his doctor, he becomes the subject of a special issue of The Avengers by writer Bob Harras that forces him to make a decision on whether or not to return to work, as he faces the reality that his life is in danger so long as he sees to the needs of Earth's mightiest heroes. In a few of the reviews posted here at the PPC, I've come to notice several instances where I've called into question the writer's intent regarding how a certain set of panels was written in relation to the art to which it applies; maybe a scene ended up reading oddly or awkwardly, or perhaps the events playing out didn't align with the words that were describing them. To be fair to the writer, my first thought should have been that I just wasn't seeing the whole picture, so to speak. I.e., "Why can't I make sense of whatever [INSERT WRITER HERE] is going for here?" The other extreme also occurred to me--that the scenes I was confused by instead made perfect sense, and my observations were completely missing the mark. But for argument's sake, let's assume (for the moment, at least) that I'm a perfectly sane reader and that I'm not quite ready to book a room at Shady Pines--and while we're at it, let's go on to postulate that perhaps there's method to Marvel's madness. "We don't work the same as other outfits. ... Well, the way we did it up 'til five years ago, the writer writes a script just as a playwright writes a play, then the playwright gives it to a director, who gives it to the producer. And the director will be the equivalent of the artist. But we don't do it that way. We have what I think is a much better system, that we stumbled into because of necessity! I marvel that everybody doesn't do this. "Don went ahead and did it. And ah, his drawings were like a crossword puzzle, I didn't know what was going on. But anyway, I put the copy in. And I found, as I was doing it, it made it much more enjoyable. Because I wasn't looking at blank paper in a typewriter, but I was writing copy for people, for drawings that I was looking at, with expressions and actions. I felt carried away. "My wife said, 'What are you talkin' to yourself about? Writing out loud, singing out loud!' So that's the way we do it now. Now I give the artist a synopsis, and he draws the story himself. I have no idea what I'm going to get. Sometimes it comes out so far removed from what I'd expect." A couple of issues back we discussed a few aspects of comic-book script writing. So, it now seems only fair to yak it up about the artwork that graces our phantasmagoric pages. 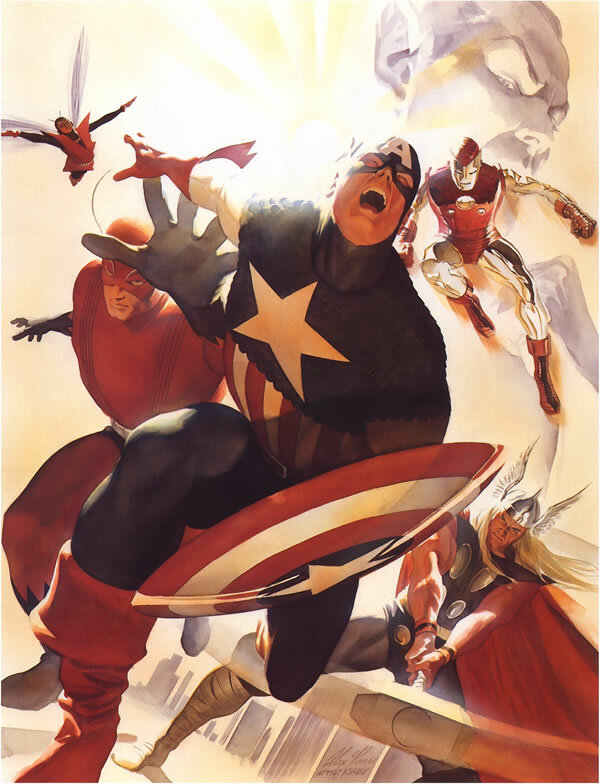 Have you ever stopped to think how multi-talented a Marvel artist has to be? Not only must he be the equal of any book, magazine, or advertising illustrator, but he must also be a master story-teller, as well. Remember, here at the Bullpen, we work differently than at any other comic-book company. Here, the artist actually collaborates with the writer on the structure of the story. Working from the script-writer's synopsis, the artist himself develops the story pictorially, and only then is the artwork returned to the writer so that he may add the required dialogue and captions. Our illustrators must be masters of dramatic portrayal--of visual characterization--of anatomy, composition, and continued-action layout. Not only must they create a viable, three-dimensional world on paper, but they must then imbue it with life, with excitement, with a sense of belief. And, above all, unlike the so-called "fine artist" who can work at his leisure over a single drawing, the comic-book illustrator must create his panels one after the other, always speeding towards an impending deadline, with one eye ever on the clock and the calendar, producing from one to three pages a day--day after day--in this, the comic-book field--a truly native American form of art which, in a few short decades, has made its influence felt throughout the entire globe. As an editor and writer, I proudly salute the magnificently dedicated, monumentally talented comic-book artists who have made the world a little more thrilling, a little more dramatic, and a lot more colorful for us all. Assuming that this was true across the board--i.e., that every writer and artist at Marvel worked in this fashion--and that the practice was in use for 25 years or so until Lee stepped down as Editor (maybe even after his departure, who am I to know? ), it would help to explain why there are lapses in logic here and there in the narrative or dialogue that are in conflict with or otherwise fall short of the images we're seeing on the page. Take, for instance, the PPC's previous post, where Dr. Strange was confronted with and overwhelmed by images of those who died while he was in seclusion following the accident which damaged his hands and ended his career. The copy attributes those deaths to Strange wallowing in self-pity: "...those who died--because you were too frightened--too morose--to perform the operations that could have saved their lives!" 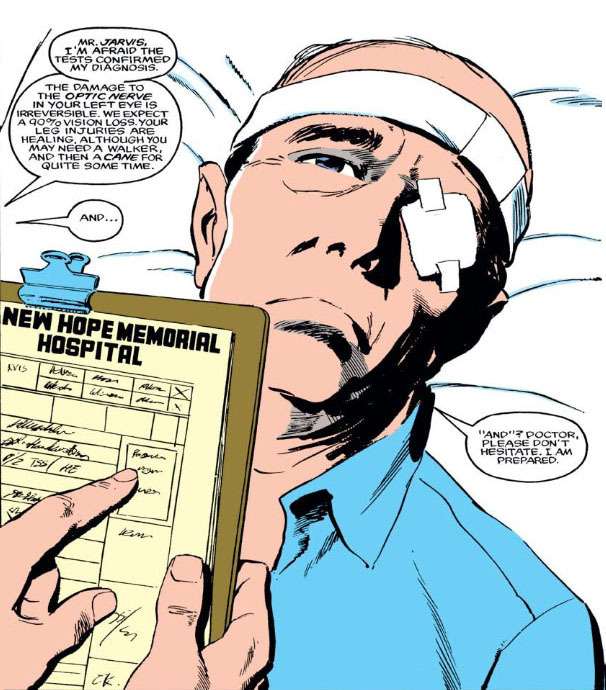 There are a lot of ghostly patients preying on Strange's guilt in that scene--yet, with his hands irreparably injured, he would have been unable to perform their operations. "...thru your cowardice--your carelessness--you killed us--killed us all!" Cowardice? Carelessness? How does either apply here? Strange was by that point incapable of performing surgery. Or, consider a scene from an issue of Avengers, where the Vision is seeking to shield both Marvel Girl and the Scarlet Witch from erupting boulders by increasing his mass. The dialogue we're given isn't more extensive than that--and it doesn't correspond with the images we're seeing that mostly show Wanda hopping on the Vision's back and all but saying "Giddyup." How that amounts to being shielded isn't adequately conveyed. Since Lee puts so much emphasis on the time factor involved in producing a comic book issue, we could reasonably assume that once the penciller has finished his pages, there is no time available for the artist to make revisions if such inconsistencies arise between the intent of the writer and the interpretation of the artist, and so the writer must make do with the artwork they have in hand, which is captioned and lettered before being passed on to the inker. 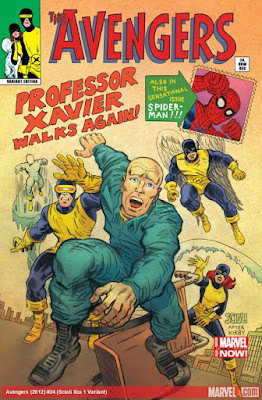 In extreme cases where what's in the can simply must be changed before press time (e.g., the fate of the Phoenix before what finally became Uncanny X-Men #137), we can also assume that both overtime and the burning of midnight oil were involved. On the whole, it would be difficult to conclude just who inadvertently dropped the ball in such cases. 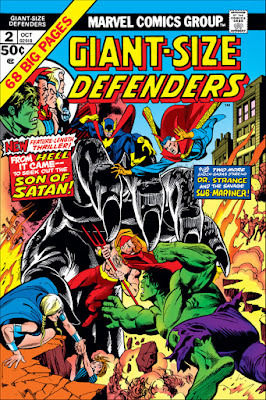 In the Giant-Size Defenders story, for example, it could have been writer Len Wein who misinformed artist Gil Kane on the details of why those phantoms were so livid with Strange; or Kane might have been provided with insufficient details of what Wein wanted for the scene, and filled in the gaps as best he could; or Kane could have misinterpreted Wein's conception of the scene and worked from his own memories of Strange's history. Perhaps even both men were on the same page and were simply working from misinformation. 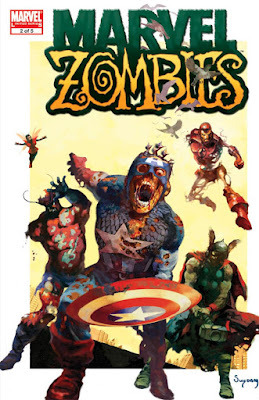 "Though the comic-book script requires the same attention to characterization, the same realistic dialogue, and the same dramatic literary structure as any other type of scenario, only the comic-book writer must contend with the torturous limitation of space! Only the comic book scripter must capsulize, in a few brief dialogue balloons, the same premise that an author in any medium may take page after page to expand upon. Yet, the comic-book writer, limited to a few words per dialogue balloon, must give his reader the same reading satisfaction, mental stimulation, and cultural fulfillment as any other practitioner of the literary arts." Please don't hesitate to offer your own insights on the matter in the Comments section. Was the Marvel "method," as Lee put it, "a much better system" of producing the work involved than closer (and more synchronous) collaboration between writer and artist (and, needless to say, editor)? Son of Satan... Son of Satannish! 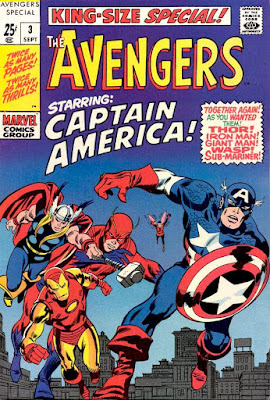 With the Defenders hitting their stride in their own series in the early '70s, it made sense for them to join other Marvel titles in branching out to the "Giant-Size" line of books which Marvel had launched across the board. 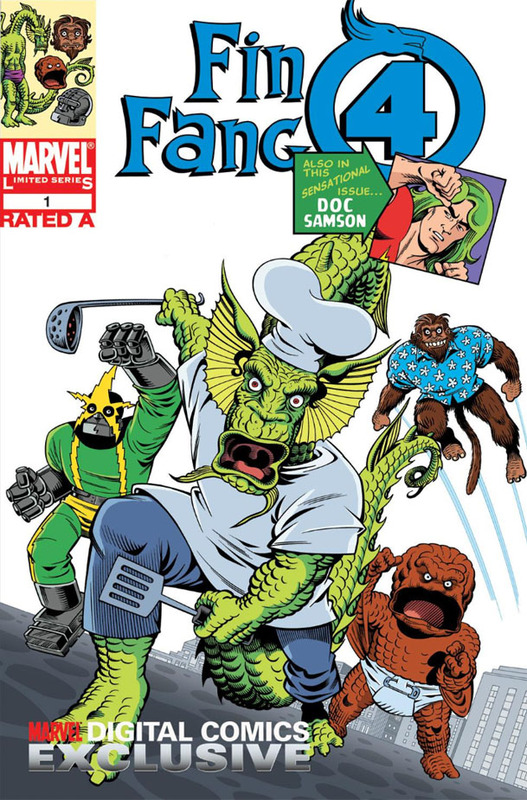 The non-team's first such issue skimped a bit and built its story around a reprint of a 1966 tale featuring an old foe of Dr. Strange, the deadly Mr. Rasputin--but with its reception apparently a success, the next Giant-Size Defenders plunged in all the way with a full-size story that guest-stars the Son of Satan in his first appearance with the group, as they meet an enemy who forces each of them to face their own personal hell. 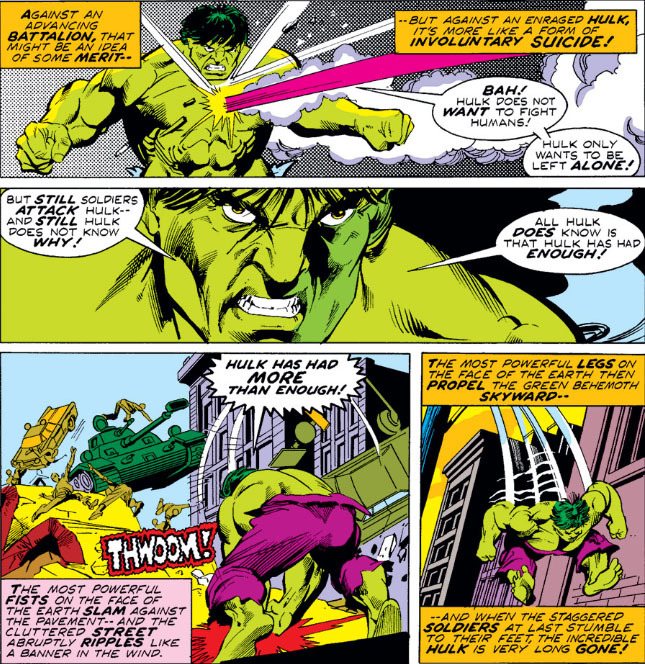 Scripted by Len Wein, who at the time was wrapping up his stay on the now-monthly Defenders book, the story also features the first-rate artistry of Gil Kane and Klaus Janson--and with Wein just about to step aboard Incredible Hulk as its regular writer, he seems to get a head start here by making the book's first nine pages a fairly decent Hulk story before dealing in the Defenders. 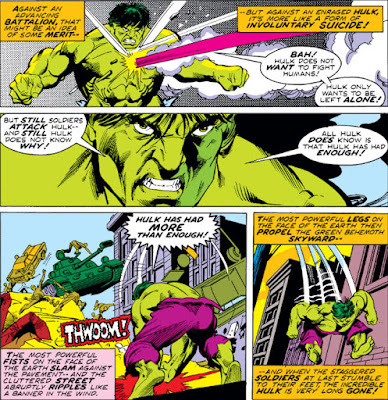 For whatever reason, the Hulk appearing regularly in The Defenders (however unlikely that would be for a character like the Hulk) helped the comic's sales considerably--particularly when The Incredible Hulk television series began airing in 1978, but still holding true in 1974 when this story was published. Naturally, the Hulk going up against assault teams hitting him with everything they have is a scene which leads off the story with a bang--and as usual, the Hulk gives as good as he gets. You weren't expecting the heavy artillery to fare any better, were you? 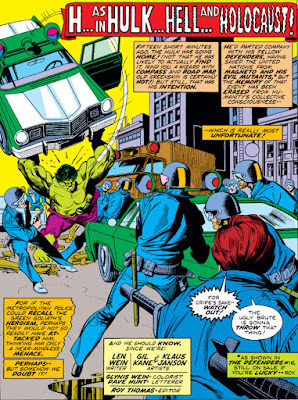 Normally, a military battle would be a Hulk story's bread and butter, though it would usually take place further into the story as events heated up; yet in this case, the clash between the Hulk and men and machinery is only a prelude to a more subtle method of leading the Hulk to a far more deadly threat. A threat that initially takes the form of a little girl named Laurie, who procures from the Hulk one of the few things he ever willingly surrenders--his trust. 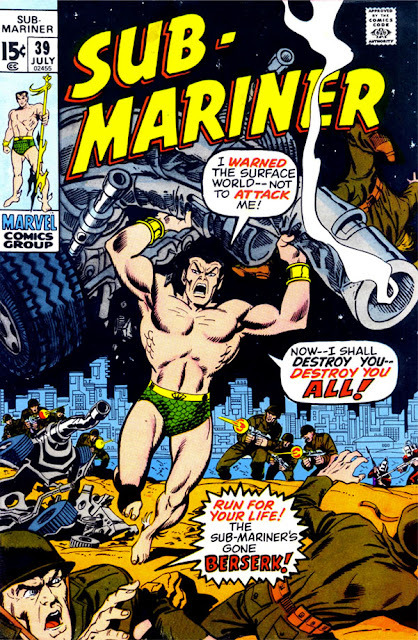 The first Sub-Mariner solo series was scripted from its beginning by writer Roy Thomas, who continued to write the character's adventures until the book's fortieth issue--opting at that point to leave the mag to focus on new projects like Conan the Barbarian and the short-lived Kull the Conqueror (among other ventures like Man-Thing and Marvel Team-Up) while still writing Incredible Hulk and The Avengers, though leaving Hulk within a few months and The Avengers in just over a year's time. Needless to say, his plate was full, and his departure from Sub-Mariner seemed well-planned, laying the groundwork to hand off Namor to a new writer with a virtually blank slate. 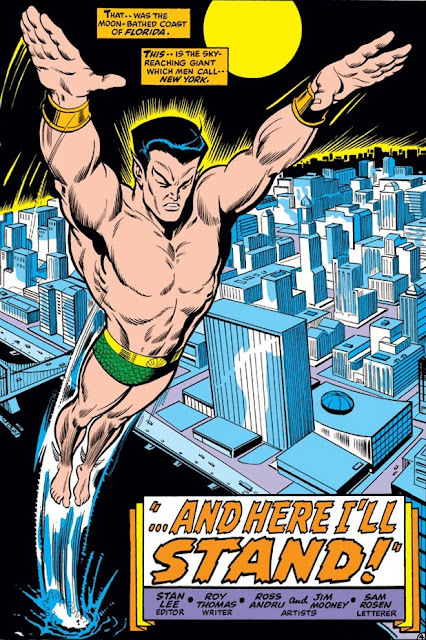 By the time Thomas left, he'd severed Namor's ties with Atlantis as well as with his long-time love, the lady Dorma, in a penultimate issue that seemed to bring the character full-circle; and now, in that issue's follow-up, Thomas sets Namor on a course away from the sea to explore the human side of his heritage. 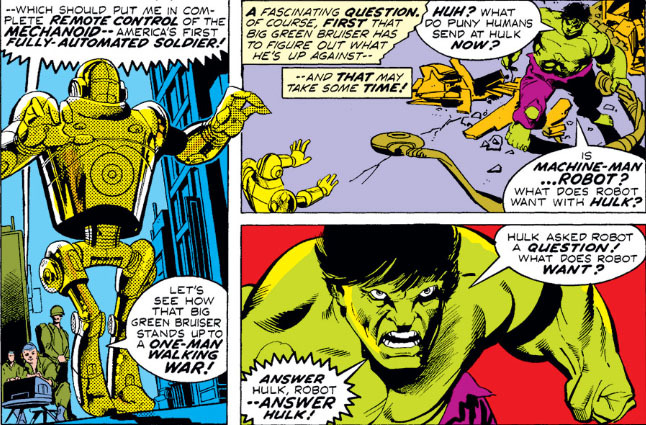 But from the looks of it, we now seem to have another Hulk book on our hands. 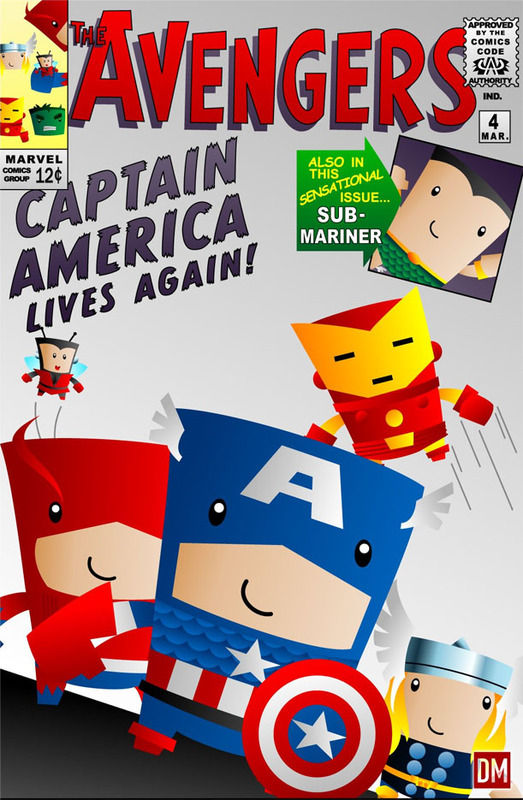 With Earth's oceans covering three-quarters of the globe, and considering Namor's feelings toward the surface world, it's an unusual move for the Sub-Mariner to choose to head for the world of land-dwellers--especially given the fact that it was on the surface where he only recently lost Dorma in a conflict with his hated enemy, Llyra. There must have been any number of locations beneath the waves where he could find solace while deciding what to do with the rest of his life after abdicating the throne of Atlantis; yet perhaps Thomas felt that Namor plunging deeper into the ocean wouldn't sufficiently engage readers of Sub-Mariner to the degree where sales of the book would benefit. I suppose it would depend on how the next writer would have explored those ocean depths with the character, and what worlds could be created there for Namor to become involved in. On the surface, Namor would seem to be (you'll excuse the expression) a fish out of water. The other unusual element in this story is that Namor would make so public a spectacle of his arrival, mired in grief as he still must be. There are easier channels for him to expatriate himself to the surface world, which at the very least would allow him to clear his head and consider exactly what he wishes to do in an existence among surface men. What draws him to the world of land dwellers--and why? We'll discover what form the answer will eventually take--but for now, Namor's decision is difficult to come to terms with. 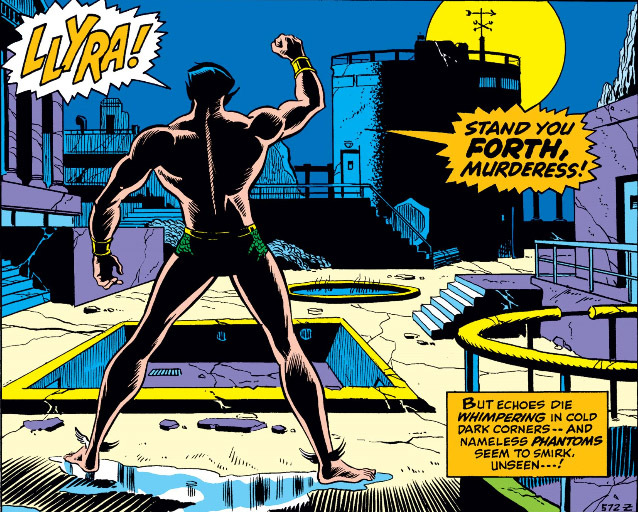 Yet first, there's the need to face the aftermath of the encounter which took everything from Namor--the Florida oceanarium where Dorma died, and where her murderer barely escaped from. 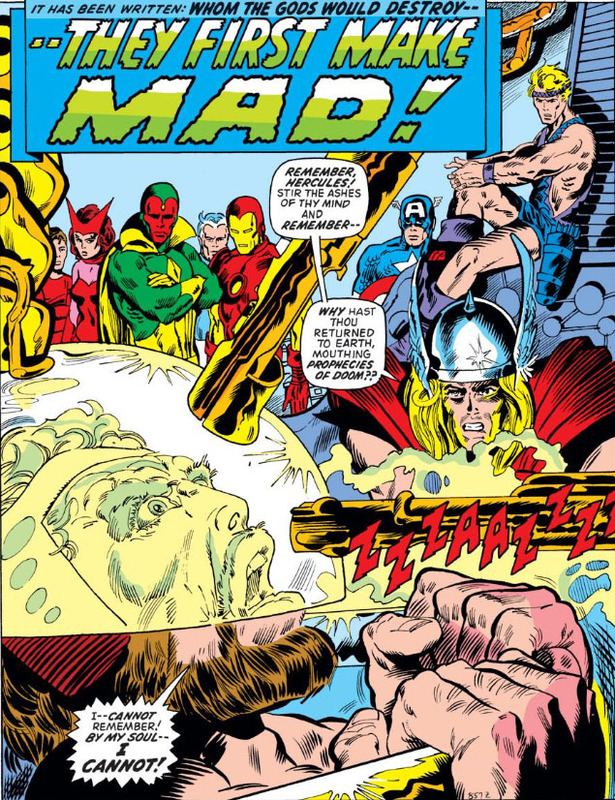 It's a powerful scene of rage, from one accustomed to making his foes pay for their transgressions--a scene that doesn't bode well for the evil Llyra and the day of reckoning she may one day face at Namor's hand. From there, we arrive at this story's dramatic splash page, which appropriately returns Namor to a historic city he's well familiar with from decades past--a place where he decides to make his presence and new status known at dawn's light. When we think of iconic comics covers, one that instantly comes to mind for me is the 1964 Avengers #4, which reintroduced Captain America to comic book readers after an absence of twenty years and all but formally made clear that the character would become the team's standard-bearer and come to embody its fighting spirit. 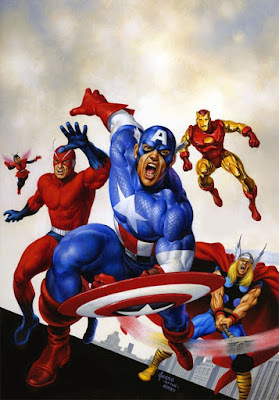 Artist Jack Kirby's basic layout of the Avengers charging into the fray both serves to rechristen the team following the Hulk's departure as well as to reinvigorate the mag with a character whose abilities are not based on strength and whose reputation precedes him. 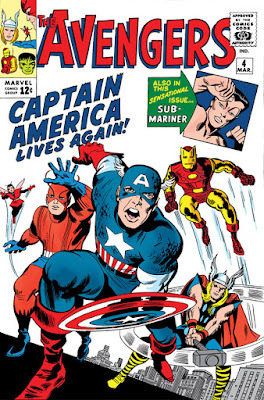 Page One of the story spills the beans by making it clear that Cap is the newest Avenger--but Kirby leaves little room for doubt about that with the overall tone of his well-remembered cover. 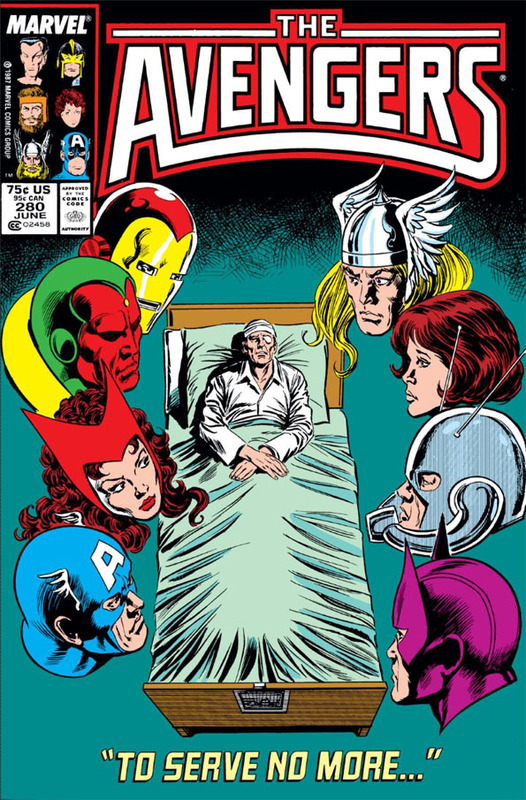 Just as we've profiled other covers here at the PPC that have been paid tribute to by other artists, it probably comes as no surprise that Avengers #4 would also have its share of artists who would use Kirby's design as a template and pay homage to his cover with their own version of this historic lineup. Following are a few such recreations (with Kirby's original pictured first), followed by a brief index of the contributing artists. Kudos to all of the talent featured here! Thanks to a couple of clever people somewhere in the vastness of the Internet, who have the gift of presenting their observations in the form of graphics, we now have a good idea of just where the Spider-Man franchise is headed as far as the age of its principal characters is concerned. Seriously, I'm drawing the line at toddlers. Confound It--The Attack Of The Demi-Gods! 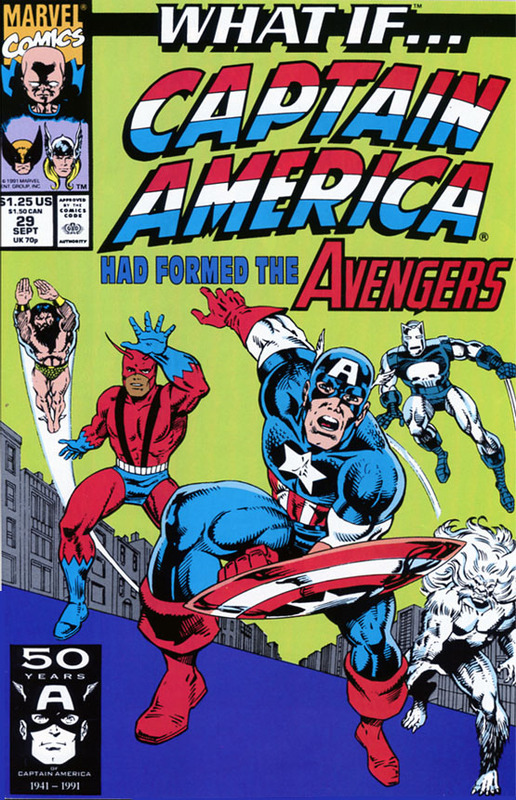 As hard an act to follow as the epic Kree-Skrull War admittedly was in The Avengers, there was still the book's 100th issue waiting in the wings, which perhaps felt like an anti-climax to what had come before. 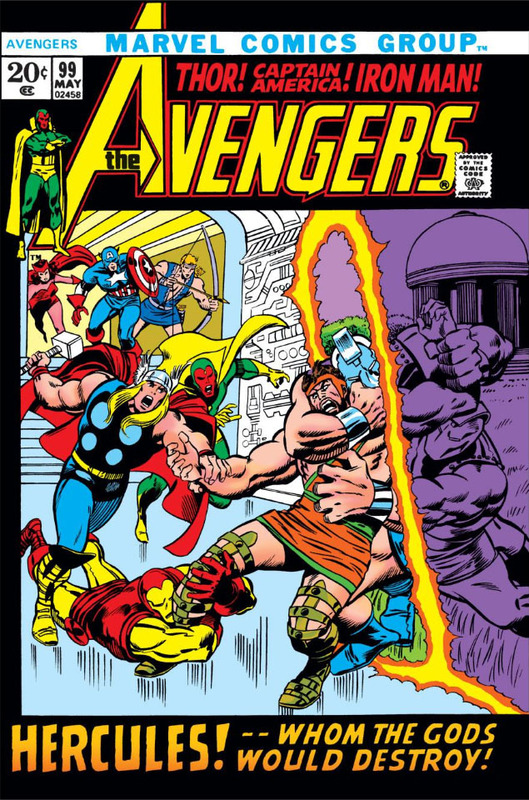 A three-part "mini-epic" that brought the assemblers into conflict with Ares, the Grecian god of war, in a scheme to invade Asgard, the story is likely better known for eventually gathering together the entire roster of the Avengers (including the Hulk)--something that hadn't been attempted to any degree since the 1967 Avengers Annual. As to what else this story offers overall--well, you have to do some digging, as well as overlook a few things that writer Roy Thomas includes in order to have the story progress from Point A to Point B to Point C, some of which were covered in the PPC review of the aforementioned issue #100. 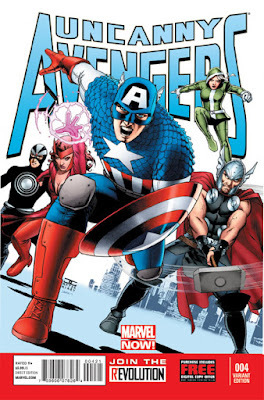 The penultimate issue, which we take a look at today, will serve to bring us up to speed on the events of the story's beginning, as well as set the stage for the Avengers' invasion of Olympus which follows--and we pick things up after the Avengers have recovered one of their own, and turn their attention to the mysterious arrival of another team member, who recites a prophecy of doom that pronounces not only the fall of Asgard, but Earth, as well. There's a certain lopsided aspect to this face-off--Strange, an adept in the mystic arts but nevertheless a mortal, vs. an Asgardian god whose power is off the scale and knows mysticism on many levels. 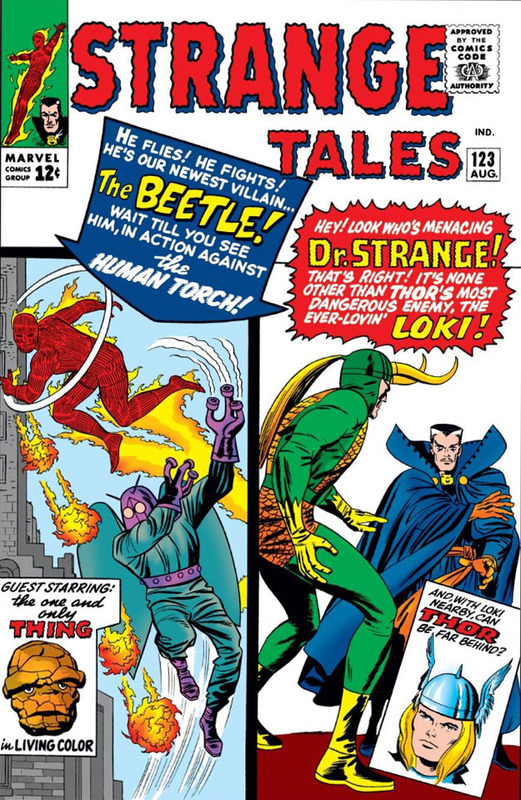 Writer Stan Lee doesn't hesitate to acknowledge the fact, yet still creates a solid story; and it's to artist Steve Ditko's credit that it comes off as visually captivating as it does. 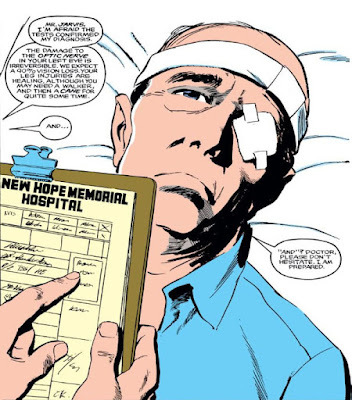 In later years, a writer like Steve Englehart or Chris Claremont might have given this kind of struggle room to breathe and explored its impact on Strange, as was the case when the character faced Dracula; but with only one issue at their disposal, and only eleven pages of it at that, Lee and Ditko still leave us with a tale which covers most of the bases we would want it to. As with most stories involving Loki seeking to strike out at Thor (never mind the fact that in terms of success, Loki "strikes out" almost every time), Lee sticks to a typical formula of Loki attempting to locate a gullible super-being to manipulate into doing his bidding. For what he has planned, in this case he only needs a certain skill set, which Strange has to offer. With the deed done, Strange soon realizes that the evil he sensed is due to Loki himself, and he wastes no time in moving against him--to the utter astonishment of Loki, who's probably more amazed by Strange's presumption than by any power he brings to bear. Nevertheless, what Strange lacks in power, he makes up for in tactics, and he uses what power he has wisely and well. 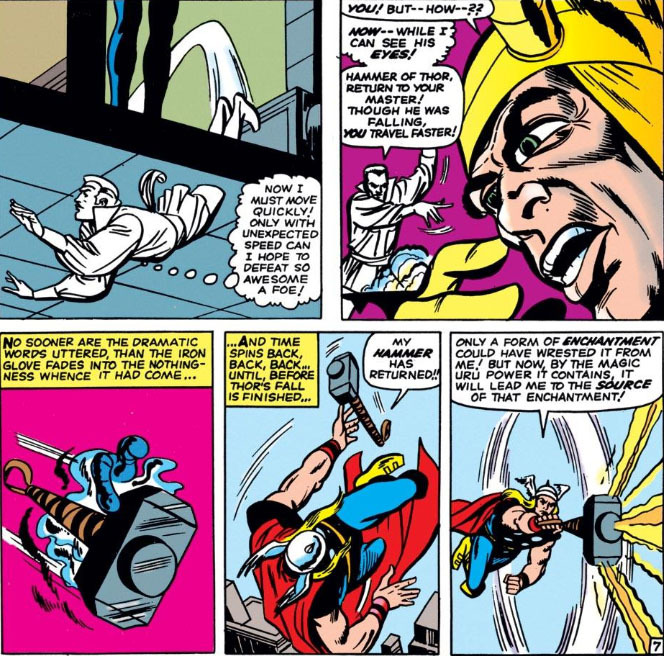 And in a crucial moment, he's able to defeat Loki's plan, if not Loki himself. 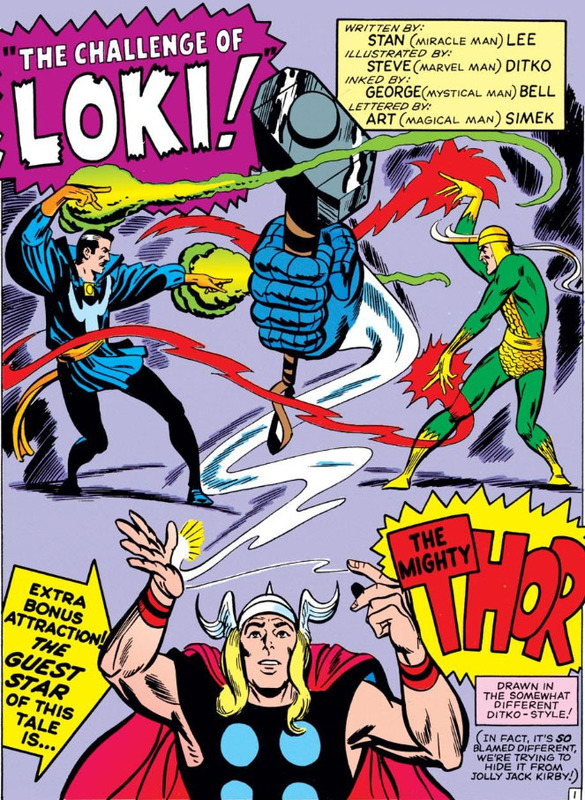 With Loki now realizing he's on borrowed time, he begins to go all-out in his battle against Strange--and though Strange is resourceful, he realizes the capabilities and power of his foe all too clearly. 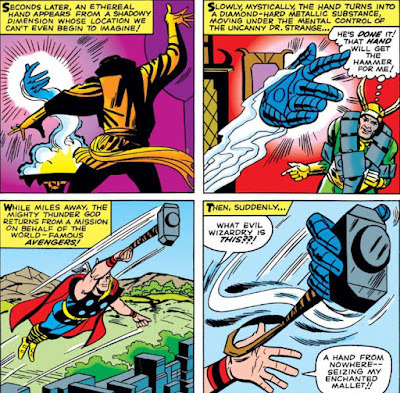 It also has to be disheartening when Loki makes it clear that, under the circumstances, he's only facing Strange with a fraction of his might. (Strange might have sought a psychological edge, and responded with "Fool! Do you think I would waste my full might on a trickster like you? I could end this battle in a heartbeat, if I wished! You but amuse me, nothing more!" If nothing else, the look on Loki's face would be priceless--the split-second before he reduced Strange to a blot on the carpet, that is. Regardless, Strange battles on--until unexpected help arrives. 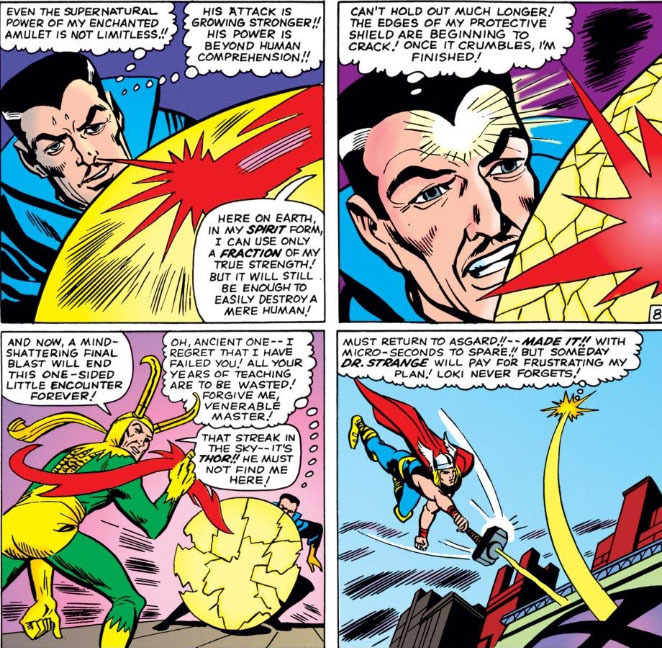 In spite of his parting vow, whatever vendetta he held against Strange appears to indeed have been forgotten by Loki, at least to my knowledge. But if actor Tom Hiddleston has his way, we just might get a spectacular rematch on the big screen someday. When you think of "comic relief" in a comic book, two characters who might come to mind are the famous pair who became steadfast friends and supporters of Tony Stark throughout the evolution of Iron Man, ever since their debut in late 1963--Pepper Potts and Happy Hogan, Stark's gal Friday and right-hand man, respectively. 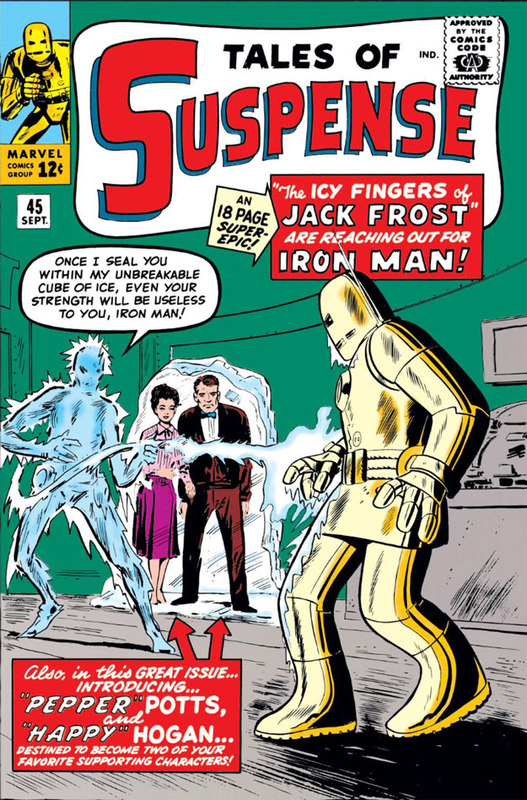 Created when alliteration was often resorted to in naming characters who were meant to become memorable, Happy and Pepper were added as supporting cast members in Iron Man's early days from Tales Of Suspense--both getting their start in the comic together, and receiving generous billing on their issue's cover, at that. 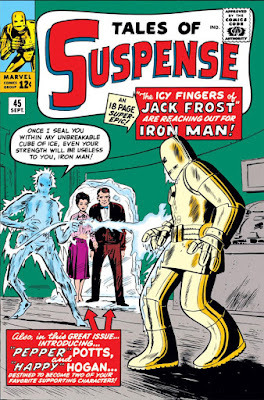 Often the foil for each other (though Happy more so than Pepper), the characters provided a more humanizing emphasis on Stark, who would of course be spending most of the issue's time in his identity-concealing armor-- giving us an excuse to peek behind the doors of Stark's office environment, and eventually becoming his trusted aides. Most of their scenes had them playing off one another, while Stark observed and often chuckled at the acerbic nature of their interplay--and for awhile, that back-and-forth between them defined their characters, as well as their relationship with each other. The Pain, And The Power! 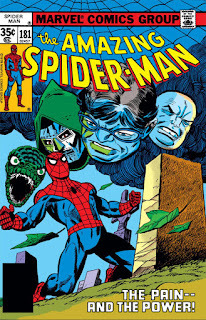 An origin/retrospect story like Amazing Spider-Man #181 came at a peculiar time in the book's run, given that there seemed to be no major need for such a story other than the fact that ASM "switched gears" a bit around this time. 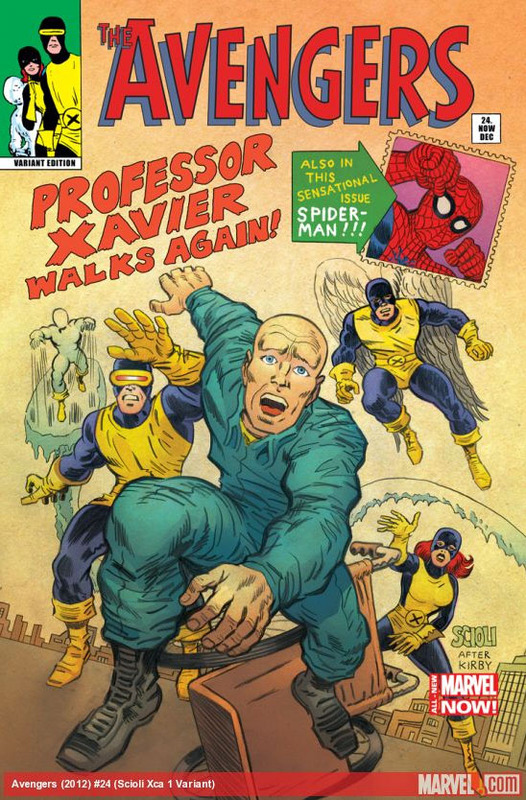 Writer Len Wein had departed the book with its previous issue; long-time artist Ross Andru would be doing likewise four issues later, when Peter Parker graduated college (sort of); Marv Wolfman would replace Wein as writer, while Keith Pollard became the new artist (albeit temporarily for both); and the milestone of the book's 200th issue was just around the corner. 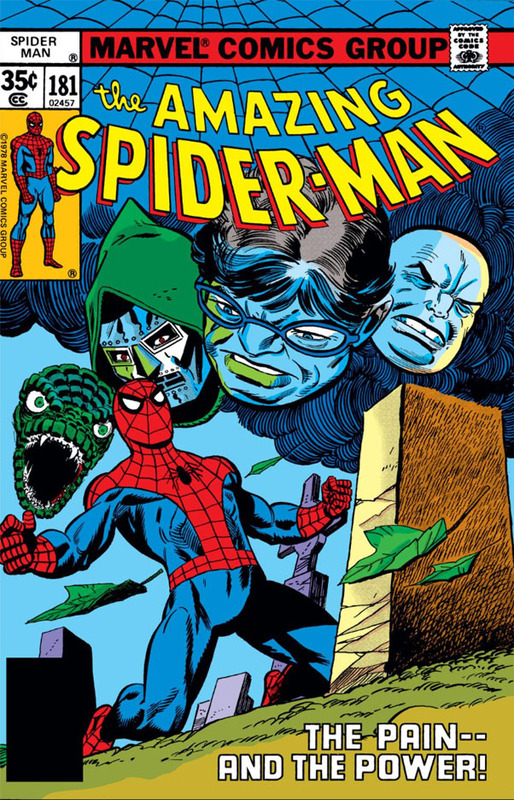 From that point, ASM would resemble something of a "try-out" book, with a number of writers, pencillers and inkers pitching in (some more frequently than others)--and when the dust finally settled, Roger Stern and John Romita Jr. would take up residence for a two-year run. So a recap of Spider-Man's life to date, while folding in another take of his origin story, closed out Wein's tenure by "taking a breath" after 180 issues before moving on. For anyone already familiar with the history of the mag or simply with Spidey's origin--or with both--the issue does little else, other than provide a visually interesting interlude, thanks to artist Sal Buscema who compiles the life of the wall-crawler nicely and hits the noteworthy points. 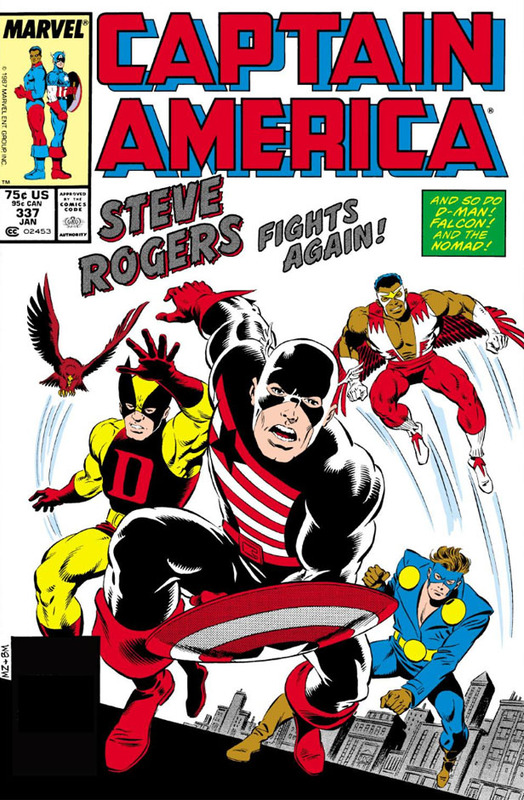 That said, parts of this issue will feel like padding in that respect by both Buscema and writer Bill Mantlo, often grouping together characters in a panel and groping for descriptive text that fits the scene. Mantlo's narrative at times is uncomfortably almost patronizing, and prods the reader into feeling that the narrative is channeling their own feelings and thoughts on the scenes being presented. 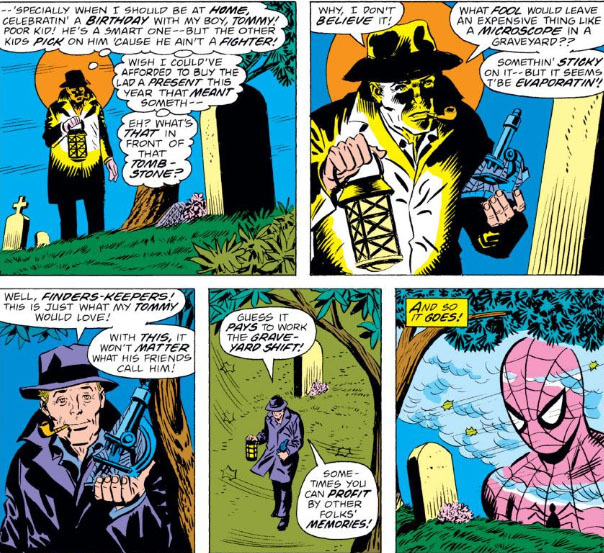 In the framing sequences, where Spider-Man reflects at the site of his uncle's grave, Mantlo shifts back to write some touching dialog--and you can only wonder how this book would read if it were Spider-Man who dictated the scenes, rather than Mantlo. 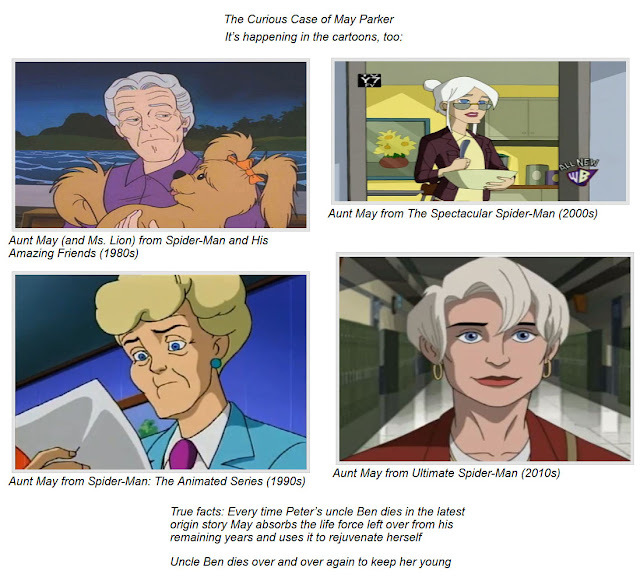 One example among many might be a scene which features Gwen Stacy, indicating an upturn in the life of Peter Parker--a scene which almost coaxes the reader to nod in agreement at the assertions made. 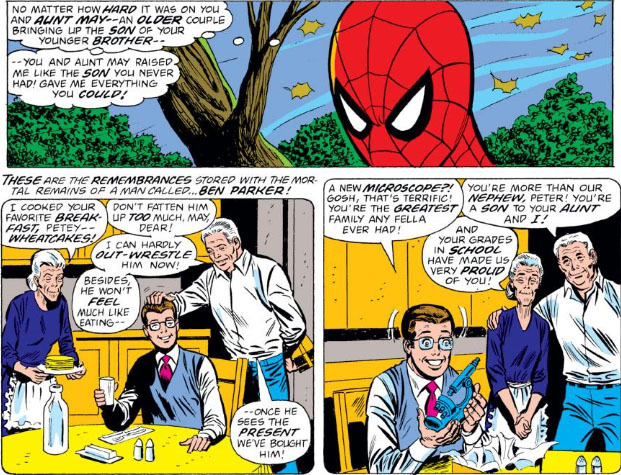 It's unclear how Joe Robertson connects to this scene, other than a shared association with the Daily Bugle. What does his desire to see people happy have to do with anything? (Is it some loose reference to handing Peter plum photo assignments?) Ditto for Capt. Stacy's approval of the relationship between Peter and Gwen--how is that important here, other than as reinforcement that isn't needed? Stacy's presence only sets up the following scene which shows his death during Spidey's battle with Dr. Octopus. 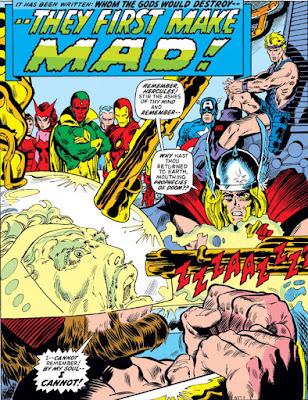 Buscema, of course, does his usual excellent job at presentation. 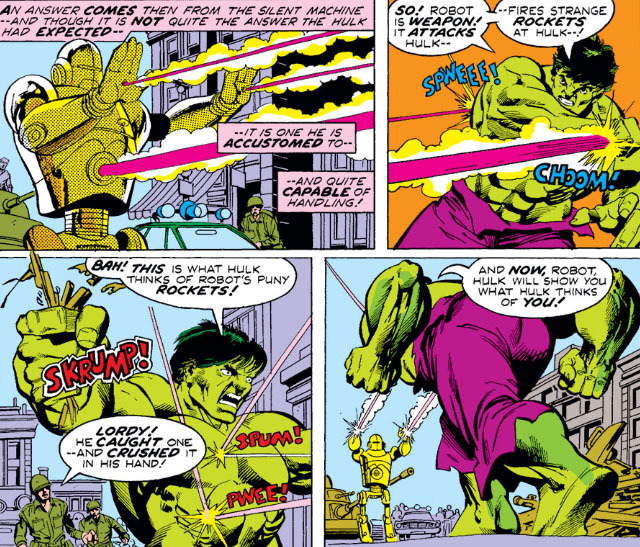 While there are certain stock shots that Buscema has in his repertoire, with many of them trotted out here, he can also be very creative when tackling an assignment that leaves room for his imagination. 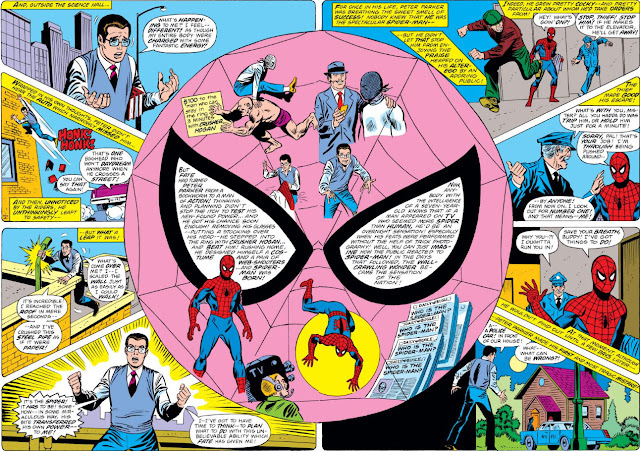 Early in the story, of course, we get a run-down of Spider-Man's origin, which can be condensed fairly briefly; but have a look at how those familiar scenes become part of the clever format that introduces the character to the world. From there, we have another impressive glimpse into Spider-Man's early history, while giving a more than generous amount of exposure to Spidey's civilian nemesis, J. Jonah Jameson--perhaps too generous, considering that there's more than enough ground in Spider-Man's life to cover without taking time to supply a virtual dossier of the publisher of the Daily Bugle. On the other side of the coin, Buscema provides a decent sampling of the villains who have made appearances in the mag, a well-rounded assemblage that could easily have become too bloated. 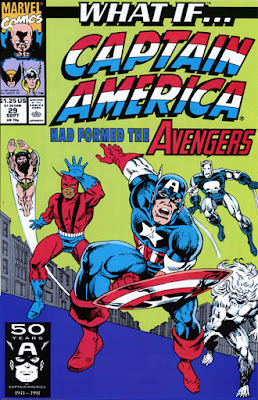 Then there's the nice framing story that gives some measure of worth to all of the history (as well as the superfluous eye candy) that comprises the issue, set off with a dramatically appropriate cover by Gil Kane that probably does the most to sell this issue. 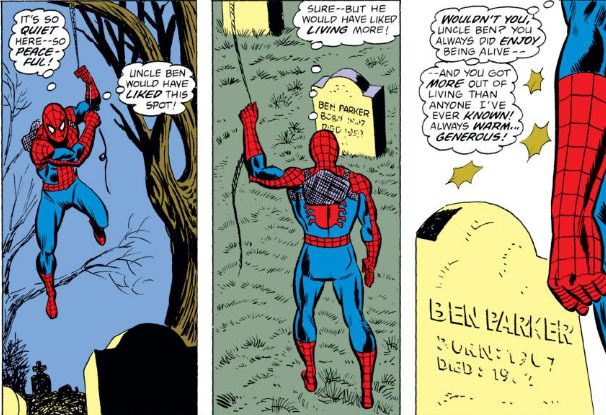 Remembering his Uncle Ben fondly and missing his presence has never been difficult for Peter--partly due to the example his uncle set for him, and partly because of the responsibility that Peter feels for his untimely death. Peter's Aunt May has also paid a visit to the gravesite, which Spider-Man observes out of sight; but when his aunt departs, we see the symmetry that Mantlo brings to the scene, though we don't fully realize it until another person arrives at the site. 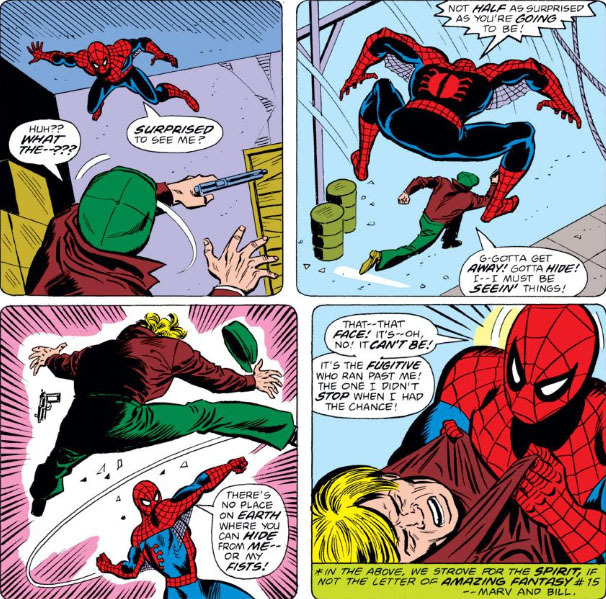 Give Mantlo credit for pulling the unexpected in the way this scene plays out--but it appears to sap this story's ending of its effect on both Peter as well as the reader. It's difficult to put into words how we feel about this man, isn't it. 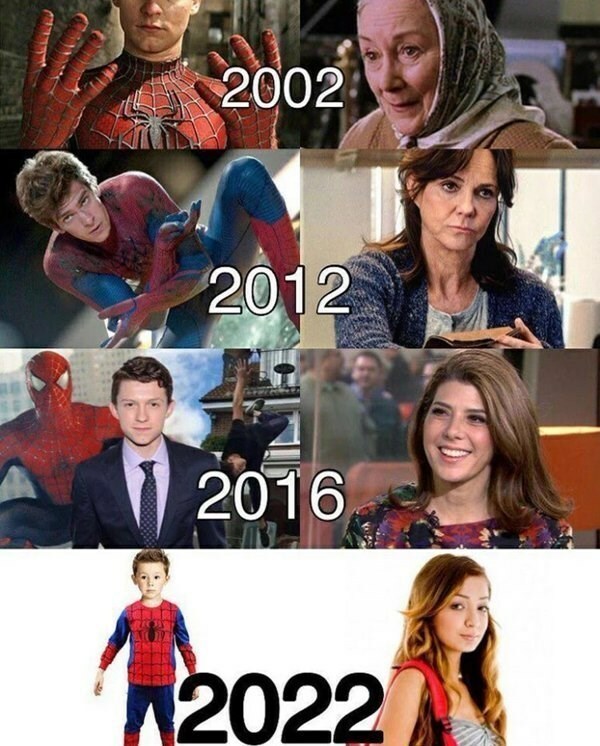 There's no mistaking the parallel between his son, Tommy, and a young Peter Parker, while the father shows a genuine concern for Tommy's situation and his future; but on the other hand, he feels no guilt whatsoever at pilfering someone's sentimental gesture toward a loved one who's passed away. Nor does Mantlo help matters much, with an "oh, well" final comment that effectively erases whatever feelings these scenes brought to the story. However you ended up feeling at the end of "Flashback!" 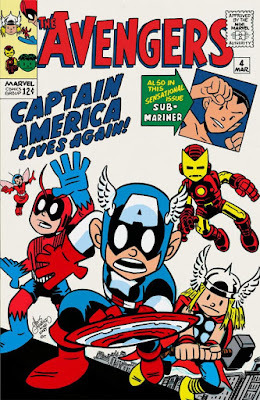 (the title of this tale), you could still find yourself quite touched by flipping the pages to the Bullpen Bulletins section, where a sad note announced the passing of a true giant (both literal and figurative) in the comics field--inker and Production Manager John Verpoorten, who died at just 37 years young. What a pleasure he must have been to work with, and to know. The Power And The Pride! We Have To School The X-Men! The Shocking Story You (Never) Demanded!